Prime Minister will announce on Tuesday that the election will be held a month from today. I look forward to analysis from our A2K British correspondents. Brown strikes me as in trouble. What say yee, or as I say, yall? I'll be following closely, too, RJB. The prime minister will begin the four-week election battle as a new Guardian/ICM poll puts the parties at their closest in almost two years. Gordon Brown will today take the journey from Downing Street to Buckingham Palace to trigger a 6 May general election to be fought on a Labour manifesto that promises a series of bold initiatives to reform public services in a programme of "national renewal". A draft of the manifesto seen by the Guardian pledges that an unprecedented fourth-term Labour government would be "bolder about the role of state intervention in markets" and deliver sweeping constitutional change. Failing police forces could be taken over by their neighbours under one radical proposal. Brown's trip to the palace will trigger four weeks of frenetic campaigning and comes as a shock Guardian ICM poll suggests Labour is clawing back support from the Tories. The poll gives the Conservatives a four-point lead " much smaller than in other recent surveys, reflecting the volatility of the electorate. Brown will meet his cabinet for 45 minutes at 9.15am before driving to the palace to ask the Queen's permission to dissolve parliament. Previewing the message that will be at the heart of his election campaign, Brown said tonight: "The people of this country have fought too hard to get Britain on the road to recovery to allow anybody to take us back on to the road to recession." Before launching his "GB on the road campaign", the prime minister will say the choice is between securing the recovery and a reckless Tory party that will derail it. He will insist that the Tories are alone in believing this year is the right time to cut £6bn in government spending. David Cameron, the Tory leader, will counter by promising to fight for "the great ignored". For the Liberal Democrats, Nick Clegg will say: "The election marks the beginning of the end of Brown." The draft manifesto, due to be put to a joint cabinet and national executive meeting on Wednesday evening, offers two dominant themes, of renewing the economy and establishing clearer citizens' rights and responsibilities. It is being stressed that the manifesto will offer progressive solutions for tough times, including reforms of public services that match Tony Blair at his boldest. • Provisions for the management of inefficient police forces to be taken over by efficient forces. "Where service is not good enough, it will be taken over by the best," the draft says. • Simultaneous referendums on a new voting system for the Commons and a 100% elected second chamber. • A national youth service alongside votes at 16. • Rights for football supporters to take over football clubs. • A living wage of £7.60 in Whitehall, funded by a cap on the salaries of the most highly paid public sector employees. Cabinet-level discussions are also under way on a range of proposals including a cap on interest charged by credit card companies and a new review of competition law by the Office of Fair Trading. Brown's team promised his campaign will be distinguished by meetings in canteens, living rooms and town halls. The contrast at a personal level will be offered between the granite resilience of the PM and Cameron's "plastic" leadership. But the Conservatives, confident they have dealt a significant political blow by promising to cut national insurance contributions next year, believe they can pull off the biggest electoral swing since the 1930s and secure an overall majority. In a London marginal constituency, Cameron will say: "We're fighting this election for the great ignored. Young, old, rich, poor, black, white, gay, straight. They start businesses, operate factories, teach our children, clean the streets, grow our food and keep us healthy " keep us safe. "They work hard, pay their taxes, obey the law. They're good, decent people " they're the people of Britain and they just want a reason to believe that anything is still possible in our country. This election is about giving them that reason, giving them that hope." 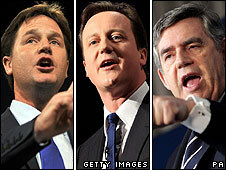 Clegg will travel to the three-way marginal seat of Watford. He will say that after "13 years of dodging elections, despite being a key player in some of the most disastrous decisions, such as taking the country into an illegal war and a deep recession, [Brown] can't avoid going to the polls any longer". Thanks, Msolga. As is my habit, I am working my address book to pull in opinions here. My initial feeling is that Labour could be in trouble, but I concede that the early polls are close. One issue that caught my eye was this from Labour: failing police forces could be taken over by their neighbours. (I am, by the way, trying to use British rather than American spelling. Tough). That was my feeling, too, RJB. I'm really hoping to hear some "on the spot" insights & observations from the likes of McT & others. It's very easy if you live in a former British colony, RJB. The 1st debate is underway. I thought I could watch it live but I can't make it work. Opening statements from the 3 candidates were pretty bland according to the BBC's summary. The 1st topic was about immigration. Well, I reckon it is over. The consensus I see amongst reporters, bloggers and people responding seems to be that it was pretty damn boring. Each candidate seemed to be worried about not making a mistake rather than offering anything substantive. 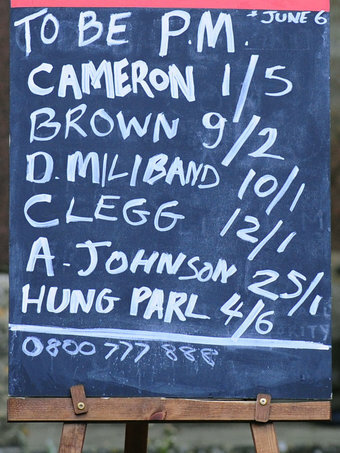 Lib Dem Nick Clegg seems to get the highest marks of the 3, but that is not saying much. He spoke to the camera rather than looking at his opponents and, according to a writer for the Guardian, made "an emotional plea for a missing puppy to be returned to its family." Ouch. 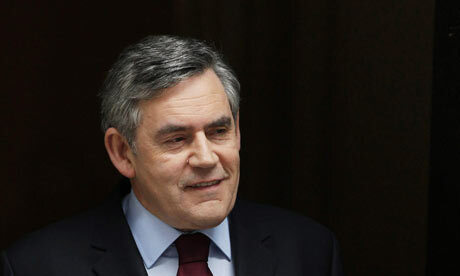 According to my notes, Labour's Gordon Brown criticized Mr Clegg for having a "holier than thou attitude." A few minutes later he suggested that the candidates "Lift the standard of this debate." I hope yall can do a better job of covering this. David Cameron will fall 19 seats short of a Commons majority, according to a joint BBC/Sky/ITV exit poll. The Conservatives would have 307 MPs, up 97 on 2005, Labour would have 255, down 94, and the Lib Dems 59, down 4. Nationalists and others would have 29. That means Labour and the Lib Dems together could not have a majority. There are reports of long queues of people still waiting to vote in some parts of the country after the most closely fought election in decades. Polls closed across the country at 2200 BST but in Sutton Coldfield a BBC reporter says there are plans to lock voters inside the Mere Green Polling Station because the queues are currently so long. The BBC/ ITV/Sky exit poll was conducted at 130 polling stations across the UK by NOP and Mori. All exit polls have a small margin of error which could be significant in a tight election such as this one, in which the three main Westminster parties have been so close in the opinion polls. There could also be different voting patterns around the country. Nevertheless, Conservative leader David Cameron might find that winning one or two seats in Northern Ireland and forming a deal with the Democratic Unionist Party might be enough to give him a majority, making him Britain's next prime minister. The exit poll anticipates that the Labour Party has been more successful at holding on to its vote in seats in Scotland and Wales in seats where there is a large ethnic minority population and where there is an incumbent Labour MP standing again. Thanks for the link, msolga. It seems unlikely to me that Mr Clegg is, in very early exit polls, not fairing better. Comment: "The people have voted for change, but they're not sure of what sort of change they want." 5% swing from Labour to the conservatives nationally. 7% needed for absolute majority. Reading between the lines: Cameron and the Conservatives are gaining ground in early exit polls at the expense of Brown and Labour but won't win outright. Clegg and the Liberal Democrats may not be doing as well as they had expected and may have to scale back on what they are demanding as a price for joining one of the other parties in a coalition. It does sound, though, from the BBC discussions I'm listening to, that the Conservatives have made progress at the expense of Labour & that nationally there's been quite a swing against Labour, particularly in England. It is also sounding like the Liberal Democrats have not achieved nearly as much voter support as expected. So how much clout they will actually have, in possible negotiations with either of the other two, is yet to be seen. (At least that's how I see things at this very early stage.) It is still not clear whether the Conservatives have won enough votes to form government. They need something like a 7% swing & only have 5%. At this stage it's still looking like a hung parliament. The BBC commentators seem to believe that the Northern Ireland vote will be an important factor in the Conservatives position. (Expected to favour the Conservatives.) But no results in yet. Interesting: constant reports of large late voter turn-outs & long queues of voters not being able to vote at all when the polling stations were closed at 10 pm. In places like Manchester & Sheffield. The situation is being described as a "a scandal" & "a failure of the system" on the BBC. Another report of polling stations running out of voting papers. Yet another of a polling station closing at 10:10. Legal challenges are sounding like a distinct possibility. In the US, if you in are in the queue at poll closing time, you get to vote. I play internet scrabble and I set my choice of dictionary tonight to "British." I got matched with someone from Newcastle who, in response to a query from me, said "I am not following it. It is all rubbish." » UK Election Set For May 6th!